Saving on fuel expense is an important priority nowadays. When you save gas, you don’t just improve your gas mileage and save more money, you also reduce your environmental impact. Thankfully, some clever fuel-saving moves – like reducing vehicle load and properly inflating tires –can really make a difference. Michelin shares some tips with you to help you making your trips safer and wallet-friendlier. 1. Plan your trips well and cut down on them, if you can. Try to schedule all your errands and tasks in just one big car trip. Starting a car that’s been parked a long time uses a whole lot of fuel for the first eight kilometers or so. Running different unplanned trips a day can cost you bigtime. Think of carpooling too, if you seriously want to save on fuel. 2. Let the traffic ease up before you go. Getting caught in a traffic jam is a waste of fuel. First gear and second gear driving use up fuel the most. If you have to go out during rush hour, travel steadily at a slow speed and avoid accelerating and braking. Always anticipate what the driver ahead of you is doing. A loaded car burns more fuel. Do not store heavy equipment, tools, and other unnecessary items in your trunk. Extra luggage on top of the roof increases the wind resistance of your car and makes it use up more gas. Remove the roof rack, bull bar and other accessories when not in use. The ideal way to travel is at constant speed. Be a patient, defensive driver who doesn’t overtake, shift gears constantly and beats the red light. Patience and discipline help lower fuel bills. Sudden acceleration burns a lot of fuel, and so does sudden and frequent braking. When approaching a stop, keep your foot away from the accelerator pad.Do not slam on the brakes,last-minute. Know how to use the car air conditioner wisely. Drive at low speed with the A/C turned off and windows rolled down to get a few extra kilometres per liter of gas in the tank. Keeping the air conditioner on while driving at high speed with the windows rolled up actually improves fuel economy, because of reduced air drag. 7. Keep tires properly inflated. Did you know that tires account for up to 20% of your vehicle’s fuel consumption? 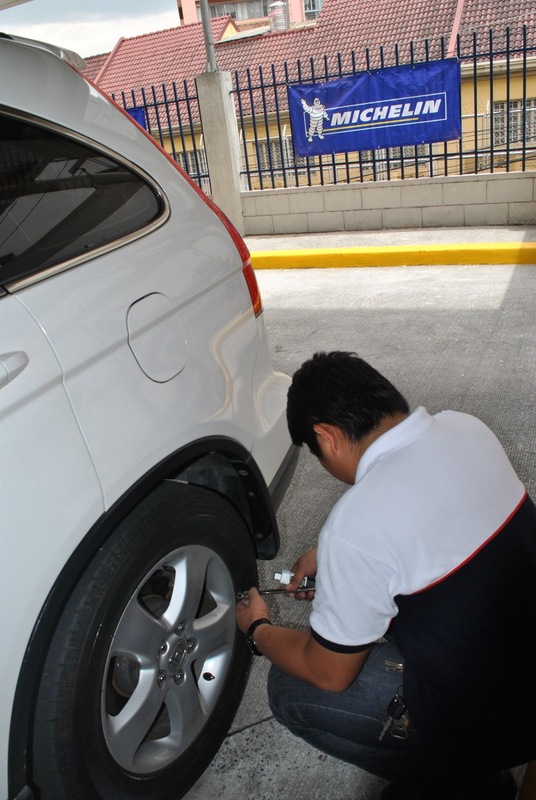 Under-inflated tires lead to a higher rolling resistance and waste more fuel. Make it a practice to check your tire pressure at least once every month to improve gas mileage by more than 3 percent. Check the right type of tires for your vehicle with the MICHELIN Tire Selector Tool and get more fuel-saving and road safety info when you log on to www.michelin.com.ph.